It’ a very good news that SSC department is offering different jobs for eligible candidates who are wishing to work as a Group-D employee under Government of Haryana. The department is going to filling up 18,200+ vacant posts under this HSSC Recruitment 2018. 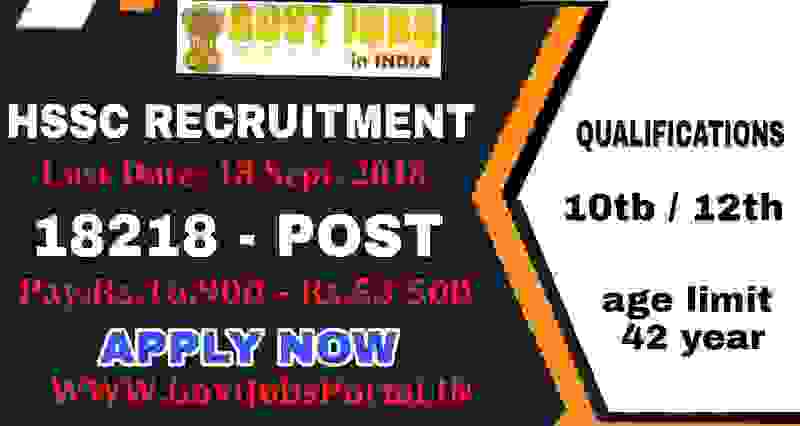 These are basically 10th pass Government jobs in India, so those who have successfully completed their matriculation exam from a well-recognized education board can apply for this SSC Recruitment 2018. The candidates who are going to fill up Group d online form, can apply through the official website of HSSC department. The candidates will get the pay scale of Rs.16,900- Rs.53,500 -Level DL if they selected for these Government jobs in Haryana. 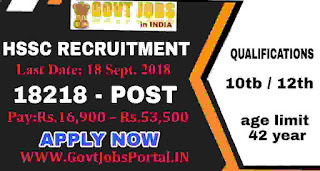 More information related to these 10th pass Government jobs in India is given below in this article. Read it wisely before moving to online form. What are the Eligibility Criteria for applying these Group d online form? All 10th Pass Candidates can apply but they must have Hindi/Sanskrit up to 10th Level can apply for this HSSC Recruitment 2018. Only those candidates can apply for these Government jobs in India whose age lies in between 18 to 42 years. What is the Application Fee for filling up Group d online form? 29TH AUG. 2018 is the Opening Date to Apply. 18th Sept. 2018 is the Last Date to apply. Disclaimer: We took this information from a PDF file whose link is “ http://www.hssc.gov.in/writereaddata/Advertisements/72_1_1_part1_compressed.pdf “ This file is also available on the official website of HSSC department. All Right of information related to this article goes to this PDF file only.